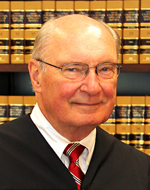 Justice Ikola was born and grew up in Michigan. He is a graduate of the University of Michigan, receiving B.S.E and M.S.E. (electrical engineering) degrees in 1962 and 1963 respectively. From 1963 to 1971 he worked as a research engineer at RCA Laboratories, David Sarnoff Research Center, in Princeton, New Jersey. During these years, he continued his education at Polytechnic Institute of Brooklyn (now Polytechnic Institute of NYU) and was awarded a Ph.D. (electrophysics) degree in 1972. Making a career change, Justice Ikola studied law at the University of California, Hastings College of the Law. While at Hastings, Justice Ikola was an articles editor of the Hastings Law Journal and a member of the Thurston Society. He was awarded the J.D. degree in 1974, graduating as a member of Order of the Coif. Following graduation from law school, Justice Ikola practiced civil business litigation in Orange County as an associate and then a partner with Wenke, Evans & Ikola (and predecessor firms) from 1974 to 1987, a partner with Hufstedler, Kaus & Beardsley (and predecessor firms) from 1987 to 1990, and as a partner with Snell & Wilmer LLP from 1990 to 1995. Appointed as a judge of the Orange County Superior Court in November 1995 by Governor Pete Wilson, Justice Ikola served on that court’s civil panel, the high impact trial team, the appellate division of the superior court, and the complex civil litigation panel. He served as supervising judge of the civil panel in 2000. During his tenure on the superior court, he received several awards: Distinguished Service Award from the Constitutional Rights Foundation of Orange County, 1996; Judge of the Year from the Orange County Bar Association Business Litigation Section, 2000; Judicial Civility Award from the Robert A. Banyard Inn of Court, 2001; Judge of the Year from the American Board of Trial Advocates, Orange County Chapter, 2001; Judge of the Year from the Orange County Trial Lawyers Association, 2001; and Judge of the Year from the Constitutional Rights Foundation of Orange County, 2001 and 2014. In 2010, the Constitutional Rights Foundation of Orange County named Justice Ikola as the James P. Gray Judge of the Year. In 2015, the Consumer Attorneys Association of Los Angeles named Justice Ikola the Roger J. Traynor Appellate Justice of the Year, and in 2018 the Masters Division of the Orange County Bar Association gave their Legend of the Law award to Justice Ikola. In 2002, the Commission on Judicial Nominees Evaluation of the State Bar of California ranked Justice Ikola as “exceptionally well qualified” (highest possible ranking) for appointment to the Court of Appeal, and in December 2002, Governor Gray Davis appointed Justice Ikola as an Associate Justice of the Fourth District Court of Appeal, Division Three. The Commission on Judicial Appointments unanimously confirmed his appointment on January 10, 2003. He was confirmed by the voters in November 2006. Justice Ikola’s current and past professional affiliations include: California Judges Association (1995 to present); Orange County Bar Association (1974 to 1995); Robert A. Banyard Inn of Court (1996 to present, program chair 1997-1998, president 1998-2000); Board of Governors, Association of Business Trial Lawyers, Orange County Chapter (2001-2003); Judicial Advisory Board, Constitutional Rights Foundation of Orange County (2000 to 2016); member of the Court Technology Advisory Committee to the California Judicial Council (2005 to 2011); member of the Appellate Advisory Committee to the California Judicial Council (2008 to 2016, chair 2013-2016); member of the Civil Jury Instruction Advisory Committee to the California Judicial Council (2009 to 2018), and chair of the Appellate Practice Curriculum Committee for the California Center for Judicial Education and Research (CJER) (2015-2016). He has also been a frequent lecturer in continuing education programs for lawyers and judges, including presentations for California Continuing Education of the Bar, Orange County Bar Association, and the Center for Judicial Education and Research. In his spare time, Justice Ikola enjoys classical music, woodworking, photographing California courthouses, and spending time with his wife, two children and five grandchildren.